A visit to America's Dairyland seeing friends, family and many sights. En route we'll see kiwi at Columbus Zoo and Chicago too! We'll be enjoying brats, beer and cheese. I have to remember to leave the Patriots hat home when in Green Bay. "The dumpster's clean; it was emptied yesterday. I don't see why you find a problem staying next to the dumpster." The proprietor of the Mid-Town Hotel in Port Allegany was taking issue because I identified where there was no internet as "the room in the corner next to the dumpster". She next wanted to know where I found senior rates posted that her manager had honored when we checked in. She didn't have any senior rates. "There is another Mid-Town Hotel in Bradford". I handed her the travel map with her hotel's ad offering senior rates. She seemed satisfied, but surprised. No internet and a rather tired grungy room next to the dumpster. The whole area was pretty run down, but Bruce was afraid it may get dark before we got to another town with motels. Every trip has low points and sometimes you hit bottom. The Mid Town Hotel in Port Allegany, Pennsylvania was this trip's low point. Winner of the worst hotel prize. Mick's Diner across the street from this rat hole was surprisingly good. Bruce's barbecue chicken special was very well-cooked and they served a good vanilla milk shake. The waitress was very professional and pretty. Breakfast Thursday morning at Mick's was also very tasty with good service. The weather turned cold and rainy with a prediction of snow so we just drove straight home. Arrived before night fall Thursday. The Wisconsin trip is now a memory. So much to see and so many people, in just 3 weeks and one day. We are so happy we went, but we are glad to be back. We don't have to worry about getting the room next to the dumpster. At least not for a while. Until the next trip. You know you are in Michigan when you see lots of American flags and lots and lots of American cars. People from Michigan are friendly and they love their American cars. We did the must do tour of the Rouge Ford assembly plant, the village of classic buildings and the Ford Museum. Wow! I could spend much more time in Detroit. Bruce checks out the classic cars display at the Henry Ford Museum. I should have been falling asleep. Dennis and Bruce were talking yet again about the trip to Florida when Dennis was 19, stopped by in his car to see them Chicago on his way to Florida. Bruce, only 16, begged Dennis to bring him along. Every time we visit Dennis, I hear about that trip. Next time I swear I'll put the camcorder and turn it into a short story. ;-) Being with Dennis is always fun. He has about 18 acres near Lake Michigan up in gorgeous Door County. He gardens, builds his own house, and he still rebuilds vintage cars. The oldest treasure, an early 30's Dodge, is temporarily out of service, so Dennis gave us a ride in his beautiful white '64 Studebaker. A ride in the Studebaker; Dennis and Bruce stop to look out at Lake Michigan. In the afternoone were back on the road, to return home. We slept in Marinette close to "UP", Michigan's Upper Peninsula. When I get home, I will look back fondly on all those mornings I woke up to hear the shot gun of hunters and passing trains. How could I ever write about Wisconsin without mentioning football? 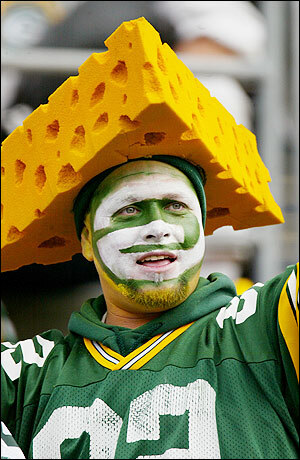 Wisconsin is the land of cheese and of "cheeseheads". Last Sunday was very easy driving. NO cars on the road - Packers 33 - Minnesota Vikings 27. Everything it seems is football. Even mailboxes. I did not have the courage to photograph the couple eating dinner in their Packer uniforms who were sitting next to us at the restaurant in Fish Creek. We had a great 2 day visit with Joann and her daughter, Sara. We are not on our way north to see cousin Dennis. After 3 days of rain and frost last night we are happy to once more have sun. In Luxemburg, Wisconsin, curious young steers investigate us. We enjoyed so much seeing Joanie (Joann) and her daughter Sara in Luxemburg whom we had just seen in Milwaukee, but fortunately Sara was now back in Luxemburg at home for a baby shower. The four of us had lots of fun sitting around the table eating good Wisconsin cheeses and breakfasts while chatting. Sad was the fact that cousin Alvin was not there. Alvin passed away in 2010 and we missed him. Alvin would have had deer hunting stories and if the season were right he would have been smoking some venison out back. So many happy memories. This morning we visited Bruce's cousin Dorothy in Green Bay. Dorothy and Bruce's great grandfather, Adoniram, was one of Wisconsin's earliest settlers. We spent a very pleasant morning. We were happy to meet Dorothy's husband and daughter. Bruce enjoyed seeing Dorothy's photo album. My hobbies are computers, travel, genealogy, cooking, video, web sites, Chipotles, early American History, and exploring beautiful Rhode Island. Wisconsin! How is it? Why do I like it so much?